People driving up to South Gate from Maun on an Okavango self-drive safari pass through this concession area on the main road. The region is dominated by thick Mopane forests. You may see wildlife such as Giraffe, Impala and Elephant. This region is relatively inaccessible and the animals are undisturbed. This concession is located in the far south of the Delta. The road up to South Gate (which goes to the Moremi Game Reserve) passes through this concession for a short way. This area can only be accessed by vehicles at the moment as there are no landing strips for light aircraft. This is one of the driest parts of the Delta and the floods reach it last in about September. The dry season during the winter months is the best time to visit this region of the Delta. Most of this reserve is covered with thick Mopane woodlands and old open floodplains which contain open grasslands. On the western side of the reserve near the Gomoti River there are thick patches of riparian woodland which is home to a greater diversity of animals. Here you'll come across typical Delta trees such as Sausage Trees, Marulas, African Mangosteens and Sycamore figs. There are open patches of savannah and acacia woodland along the road from Maun to Southgate which passes through the concession. The main species of trees here are Camelthorn Trees, Leadwood trees and Umbrella Acacias. There are areas of flood plain that flood in years with an exceptionally high flood; these old floodplains are covered in wild sage and short acacia bushes. There are areas that flood every year. Impala and Tsessebe are the most common antelope in this area of the Delta. There is also a healthy population of Giraffe, Kudu and Warthogs. If you are lucky you may encounter one of the small groups of Sable Antelope that live in the region. 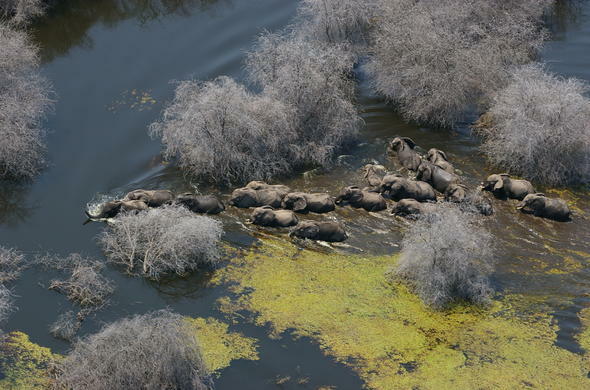 A highlight of an Okavango safari is the large herds of Elephants and Buffalo that pass through in the dry season. Lion are the most common predator in the area and African Wild Dogs are often seen, though they roam widely. Cheetah and Leopard do occur in this region of the Delta, but they are rarely seen as many areas of this concession are fairly inaccessible. Being on the southern fringes of the Delta, this region has a good mix of wet and dry habitats which are home to a diverse number of bird species. Commonly seen are Long Tailed Glossy-Starlings, Cape Turtle, Mourning and Red-eyed Doves, Red Billed Quelias, Buffalo Weavers, Crimson breasted Shrikes, Helmeted Guinea Fowl, Kori Bustards. In the drier thickets you will often see Red Billed and Swainson's Francolin's as well as Namaqua, Burchell's and Yellow throated Sand Grouse. The woodlands are home to Meyers Parrots, Red and Yellow Billed Hornbills. Raptors commonly seen include Bateleur Eagles, Vultures and different Kite species. In the drier regions you may see the occasional groups of Ostriches. The best time to visit the Sankuyo region of the Okavango for game viewing is during the winter months when there is less foliage and you will see more of the wildlife. The best time for bird watching is from December to January. This area is particularly noted for its walking safaris. These are led by expert guides who will teach you about the habitat of the region. These walks are often longer and more challenging than those offered by other lodges. Game drives are one of the best ways to view the wildlife in the area, as much of it is confined to the Mopane woodland and Riverine forest around the Gomoti River. Many camps in the concession also allow night game drives which allow you to see the regions nocturnal inhabitants.